We put forth a wide array of Labrador Dog Tag to the patrons. 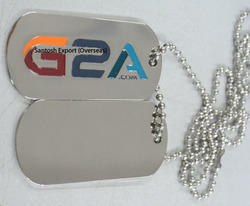 Our provided tags are made using top quality material. Moreover, it is accessible with us in diverse specifications and designs given by patrons to satisfy the diversified needs of the customers. A unique way to keep ur pet safe, by keeping his or her info. with them . In case they get lost somewhere. 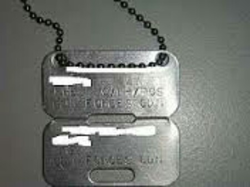 The tag will contain - PETS NAME , OWNERS NAME , FAMLY , PHONE NO. Never Lose your pet again! Made in acrylic. Can be customised into various Colours/Design/Size. The Brushed Chrome Black Bone Personalized Engraved Pet ID Tag is a must have for every pet. Not only is this Tag brushed chrome bone-shaped personalized identification tag fashionable, adding a charming touch to your pet’s collar, but it also plays a key role in your pet’s overall safety. We are engaged in manufacturing an exclusive range of Pet ID Tags, which are used for Pet identification along with the basic important medical information for following latter treatment like history of inoculations and blood type. These are available in various sizes, shape, colors and designs.